View Who Needs Dashboards? on Notist. Creating useful dashboards is difficult. Figuring out what information should be displayed, where and why can be confusing. A useful first step in getting this right is to know who your audience is. Who will be using this dashboard? What for? What do they care about? Together we will explore some of the many forms of dashboards, from those that are of most use to developers to those that display higher level information for business’. We’ll examine why they are important and what situations they are most useful in. No matter what your role within a company, there will be a type of dashboard that will dazzle you with its insights. Come along and find out which dashboard you need. 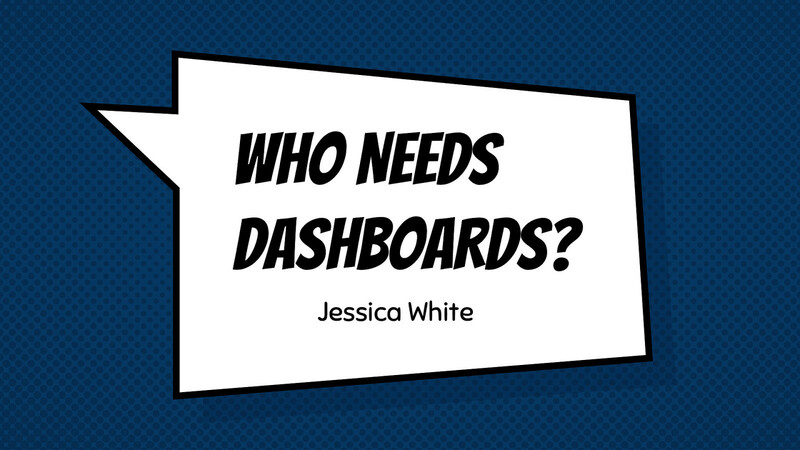 Creation of impactful dashboards - what to do when starting to put together your dashboards. Covering what a dashboard is, and some tips on what to do when thinking about creating a dashboard. Getting the most out of your dashboards on a day to day basis - Continuous Maintenance. Covering maintenance of dashboards. Some suggestions on how to keep dashboards useful, and some considerations when working with them. Danger Signs of Dashboarding - Times to make a change. Exploring are the signs that a dashboard may need a bit of clearing up or re-work. Do you have a nagging feeling that your monitoring could be improved, but you just aren't sure how? This is the book for you. Practical Monitoring explains what makes your monitoring less than stellar, and provides a practical approach to designing and implementing a monitoring strategy, from the application down to the hardware in the datacenter and everything in between. In the world of technical operations, monitoring is core to everything you do. In today's changing landscape of microservices, cloud infrastructure, and more, monitoring is experiencing a new surge of growth, bringing along new methodologies, new ways of thinking, and new tools. Complete with a primer on statistics and a monitoring vocabulary, this book helps you identify the main areas you need to monitor and shows you how to approach them. It's ideal for operations engineers, system administrators, system and software engineers, site reliability engineers, network engineers, and other operations professionals.
.@JessPWhite giving her talk on dashboarding. full room!